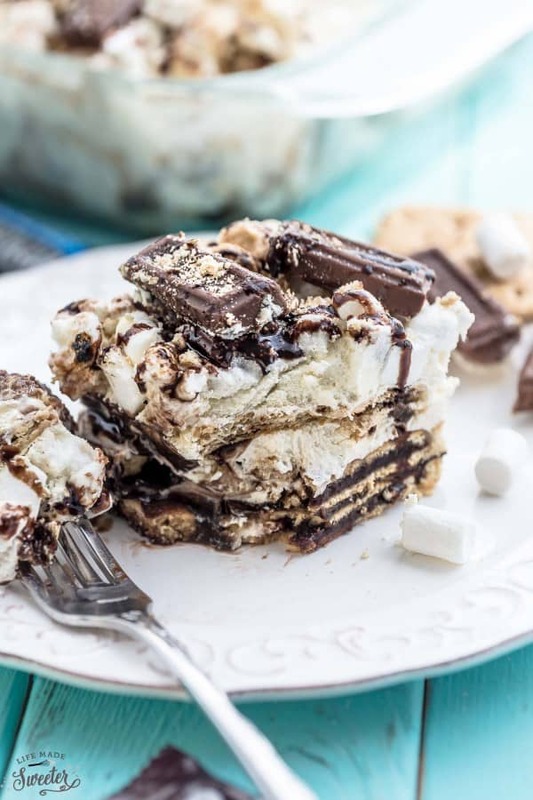 No Bake S’mores Icebox Cake is the perfect way to enjoy S’mores without a campfire. Best of all, it’s so easy to make and combines all the favorite flavors of the popular campfire treat. Made with Pop-Tarts®, whipped cream, marshmallows and graham cracker crumbs. Plus recipe video. Nothing screams summer like a classic campfire s’mores. 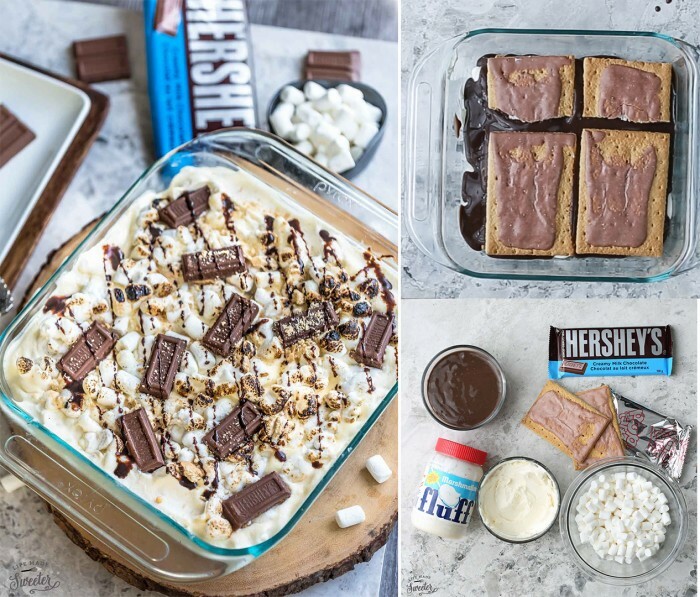 There’s just something about toasted, gooey marshmallows with melted chocolate and graham crackers. It totally brings out the kid in you! 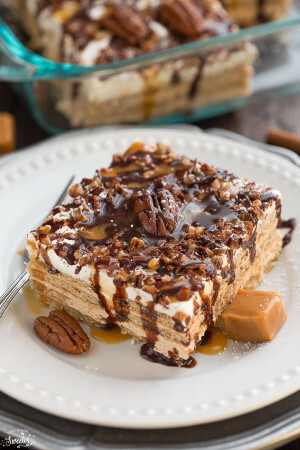 And since August is National S’mores month, I have a few fun s’mores inspired recipes lined up starting with this No Bake S’mores Icebox Cake. 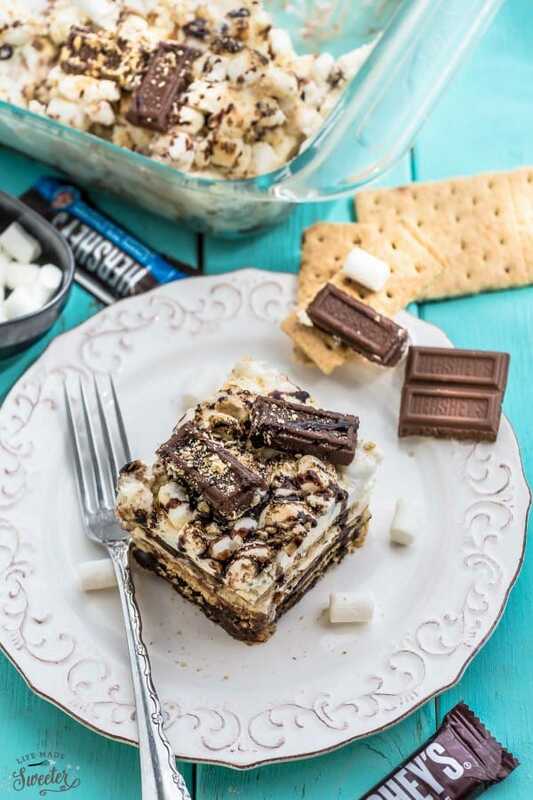 This S’mores Icebox Cake combines all those classic campfire flavors in an easy no bake dessert. And you don’t have to leave the comfort of your kitchen. For an extra fun twist, I used these S’mores flavored pop-tarts® for the layers. I was easily able to find these but if your local store doesn’t carry them, you can totally use the plain toaster pastries or just graham crackers instead. 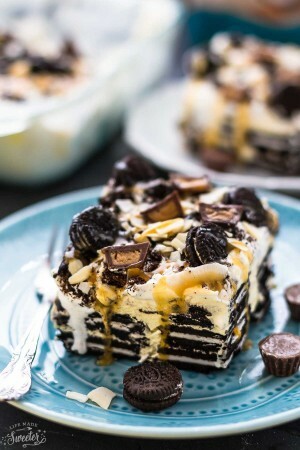 Each layer gets covered with a gooey marshmallow filling made with whipped cream and marshmallow fluff between alternate layers of your favorite creamy chocolate pudding. 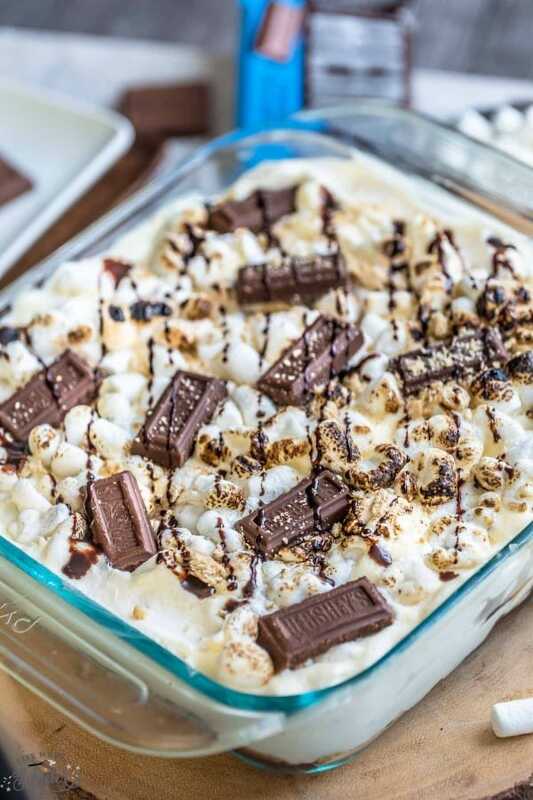 The topping is made up with some crushed graham crackers, Hershey’s bar squares and ooey gooey toasted marshmallows. Toasting them is a must to give them that magical, s’mores flavors – I used a handheld torch, but if you don’t have one, just pop them under the broiler for a minute or until they’re golden brown. 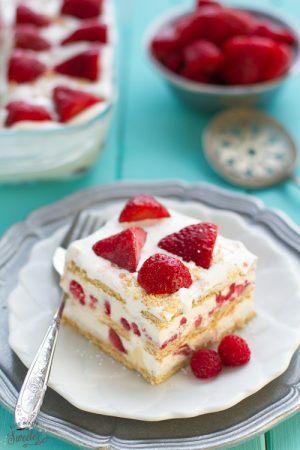 Like most icebox cakes, the hardest part is waiting for everything to set up in the fridge. 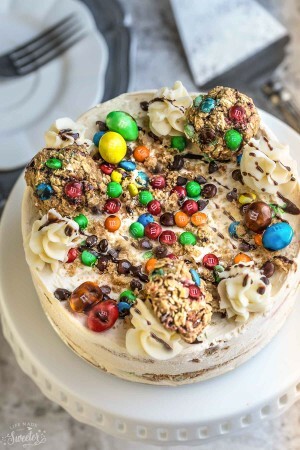 If you’re planning on bringing this to a summer party or cookout, the best thing to do is make it ahead the night before, that way it’s ready to go once you wake up. It’s a fun and easy way to make s’mores for a crowd, no campfire needed. 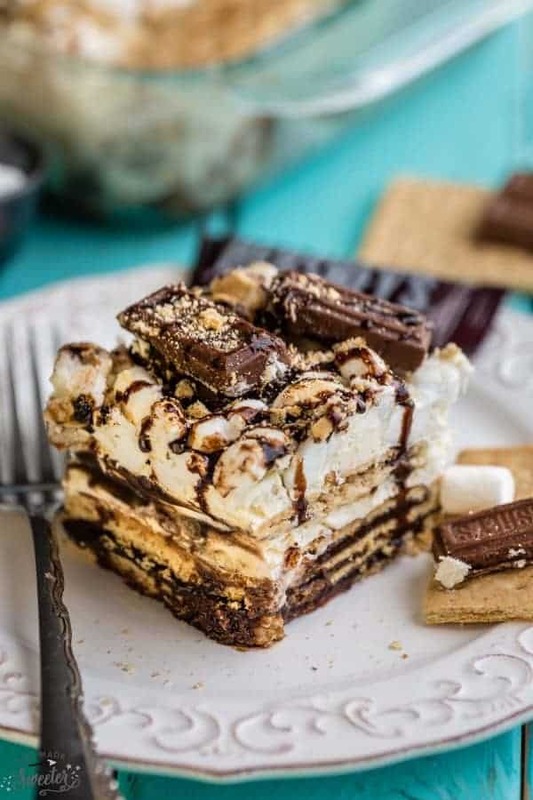 S'mores Icebox Cake combines all the best flavors of the classic campfire treat in a fun and easy dessert using pop-tarts®, whipped cream, marshmallows and graham cracker crumbs. To make freshly whipped cream: With a hand mixer or in the bowl of a stand mixer, whip 1 cup of heavy cream until it just holds soft peaks. Add 1/4 cup of powdered sugar, 1/2 teaspoon of vanilla extract and whip to combine until stiff peaks hold. Do not overmix. Set aside 1/2 cup whipped cream for topping. Assemble the cake: Fold marshmallow fluff into whipped cream and spread a thin layer of the mixture in a 8 x 8 pan to coat the bottom. Place 2 pop-tarts® across the center of pan and then break up 1 more as needed to fill in the gaps. Spread half of the marshmallow cream layer on top. Top with another layer of pop-tarts®, breaking them as needed to make them fit. Spread the remaining marshmallow cream mixture over top. Spread remaining pudding over. Top with the final layer of pop-tarts®. Spread the reserved 1/2 cup freshly whipped cream (or Cool Whip) over evenly. Sprinkle with an even layer of mini marshmallows on top then scatter a few pieces of Hershey's chocolate and graham cracker crumbs on top. To toast the marshmallows: lightly char the marshmallows with a handheld torch after placing on the cake. Or place 1/2 of the marshmallows on a parchment under a broiler until just browned then allow to cool prior to adding them on the cake. Drizzle with chocolate sauce if desired. Refrigerate for at least 4 hours or overnight until the pop-tarts have softened completely. Serve chilled.